Looking for a comfy and fun hostel where you´ll have a good night sleeps in our big beds, great showers and meet fellow travellers on our sunny rooftop? Don´t look further! 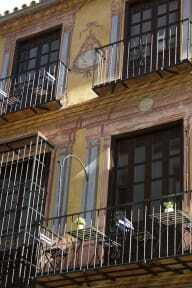 We've spent a year renovating a historical building in a superb location right in the centre of Malaga. Come check us out and see why we love it here! We're a friendly place, its our place and we really care about it, so we want to give you the best possible experience while you stay in sunny Malaga – the warmest city in mainland Europe! Free Sangria every evening to invite all our guests!! Free map and touristic recommendations. Plus if we go out, you're going out with us. Special prices on bike/ electric scooter rent, flamenco show, etc. Free Wi-fi in every room, common areas and even on the roof terrace! Free use of hairdryer and hair straightener. Air conditioning for summer and blankets for winter. Showers with two types of shower head (check out the pics), some cubicles are big enough for a party...er but please don't...we have the terrace and common room for that. Each dormitory bed have a bed light, a curtain and a power supply, also personal lockable storage (you need your own lock). Windows and balconies in all rooms. Modern key card entry that won't demagnetize itself the moment it goes near your mobile phone. Ah yes, the roof terrace!? Come check it out...its pretty sweet! We are the only property with a roof terrace and balconies with views over the Semana Santa and Feria Festivals. No smoking indoors or on the balconies - go to the roof terrace and make some friends at the same time. Please do not keep food or eat in the bedrooms. We have full kitchen and fridge. Please don't use your sleeping bags and bedding, we provide linen for you. A lot of things are free, but we need to take a returnable deposit to ensure they don't go walkabout (5 Euro's). Important: With the aim of being completely transparent to all our guests, we want to inform you that there are works being done next to the hostel, the city is building a new metro line and unfortunately it can create noise nuisance. We are not able to provide you with the exact dates or times when the works will be noisy as it depends on the pace and contingencies of the construction. We apologise in advance for any inconvenience caused and are offering free earplugs at reception to help with the issue. During Semana Santa (7-15 April 2017) y Feria (11-18 August 2017) all reservations are non refundable and might be charged anytime after booking. Any Cancellations and Modifications will incur a charge of 100% of the amount of your booking. Group bookings; 8 people or more is a group booking. Please contact us before and we will try to put you in the same room. We reserve the right to cancel any group booking that is made without contacting us beforehand or reservations made up of smaller reservations that add up to a group booking (i.e. 3 reservations of 4 people = 12). Credit card payments are taken but we'd be happy bunnies if you pay in cash! We only accept adult above the age of 18 years old, no children under the age of 18 years old can sleep in shared dormitories. Children can sleep in private rooms only if the are accompagnied by an adult who is responsible for them. This was the best hostel I’ve stayed at. The staff was so friendly and everyone staying there was super nice as well. The facilities were kept very clean. They offered great prices for drinks and even free sangria and dinner every night, allowing everyone at the hostel to socialize. It was a great atmosphere overall and I truly enjoyed my stay. It was great. We were present during the Semana parade (easter week) and it was difficult to get back. The free supper is very good. 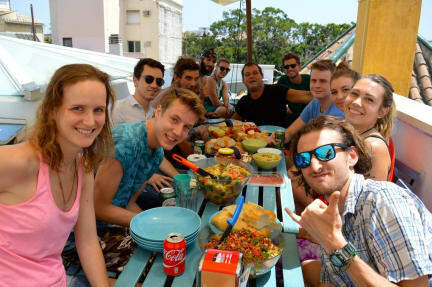 Great hostel, well located, nice rooftop where you can meet people around free sangria and free dinner ! Excellent value ! Great view of Semana Santa - but with that said the processions do block the front door of the hostel and the crowds can get quite big - it can take a bit of time to get back into the hostel. Otherwise great experience - Big and clean rooms, large kitchen, friendly staff and great location. My favorite part was the rooftop bar and free dinners. For a solo traveler, this made it extremely easy to socialiaze and meet new people. The staff was very nice as well. It’s walking distance from basically all of the importants parts of Málaga, and generally comfortable in terms of sleeping situation and bathrooms. This hostel had a nice social vibe. Little bit more expensive than anywhere else i´ve stayed in Spain, however the dinner in the evening was much better quality than any other hostel. Had really good nights sleep here. Would return. Was great staying in the light hostel . The staff was nice . But it's not clean at all I was in room 303 The bed was smelly and dirty and insect in the bed .I can't sleep because of the insect in the bed .I don't go there again.